Neda saying Kyle and Adel are causing problems for her. Neda asks her if she is OK with Andrew. Heather says the only person she’s heard pass Neda’s name around as a target is kyle. Adel brings up how Sabrina was rude to him earlier in the day when he was cutting a steak on the grill. He tells her she always takes things to heart. Arlie says it makes sense that Andrew would target Paul points out that PAul put Andrew up week one and proceeded to tell everyone to take Andrew out week two. Paul says the females are coming after them. Their groups has a leak and someone is working with the females and they are going to flip the house. Just between you and I and this is going to dsound f*** up.. I think it’s kyle and Adel working with the females. Sabrina brings up Adel drawing a knife to her face. Paul is going over his theory about the leak in their group of 5. He tells the camera that his plan is to throw kyle under the bus and cause confusion. Some dishes break due to a game they’ve been playing .. They tell Adel he’s been acting sketchy they need 100% assurance that he’s with them. They all agree Paul is freaking out. OK, Paul just had his second “monologue for the camera” in the storage room within 30 minutes. That’s pretty sad considering he calls himself a motivational speaker: he doesn’t have anyone to actually talk to and feels so insecure about how “dumb” people see him outside that he feels the need to “let us know” what a mastermind he is. What’s happening guys. Just getting caught up right now in the 2 episodes. Probably check out the live feeds in a bit. Can someone give me some sort of rundown on the dynamics of the house haha. I know thats kinda asking a lot. I really really appreciate it!! There are like a dozen different alliances atm and I don’t think most of them are going to stay. Kenny and Andrew are close, I think Jon/Arlie are with them too. And there is also an all girls alliance called “the stupids” with all the girls excluding Heather. But it seems like Heather is close with some of the girls so I’m kinda confused. After having been HOH during the entire time up to now, Paul experienced his first day as a “normal BB player” and pretty much imploded within a few hours. 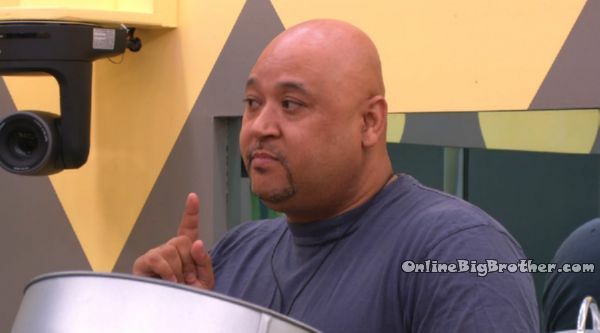 That was almost reminiscent of Willie Hantz from BBUS14. The 1st HOH lasts for so many days, and it’s pretty much the first “taste of BB” he got, you can get used to it and when you’re no longer it, you completely freak out. It’ll probably be him or Kyle leaving imo. Andrew and Kenny seem to stick together tight. They pretty much “bullied” Adel into “being with them, or against them”… Obviously he said “guys, I’m 100% with you!”, but I wonder how he’ll react. 2 5 person alliances one all girls the other all guys. the guys in general better defined so far with Kenny well liked by the house and Andrew early on a comp beast. Over all the BB seasons I can’t remember a long term group of 5 or more being effective. There seems to always be a core of 2 or 3 within in larger groups that are the real power. I figure a 3 or 4 guy alliances will come out after 3 weeks as dominant. Paul’s insecurities and scheming could ruin that though. I see Kenny, Andrew and Kyle as a serious set of triplets to deal with. Bring in Jon and Adel pretty strong 5 players. Looks pretty good for the new HG being Allison IMHO. So on the numbers that seems to favour a repeat of week 2 on numbers and strategy for week 3 unless 1) The guys try to bring Allison in or 2) someone actually see the value of keeping FLOATERS for a while! I deem Heather floater material for now. Why would Andrew want to get rid of her? And back dooring this early isn’t necessary and will hurt his game long term for no good reason. Lastly they need to keep Paul(idiot) off the block as a needed vote this week and next at minimum. The ladies need a couple HOH wins starting next week. So production better put some luckbox HOH challenges in real quick. PS Keep putting IKA up she’ll become a nut job and make the house very entertaining to watch for a week. Simon & Dawg, how are you guys watching the live feeds? Hola is gone, and BBViewer isn’t picking up anything. Do you guys live in Canada? This season is different from previous BB of past. Its early and I can’t wait to see more drama and turmoil to unfold. In addition I’m on the Paul needs to stop talking to the camera team!